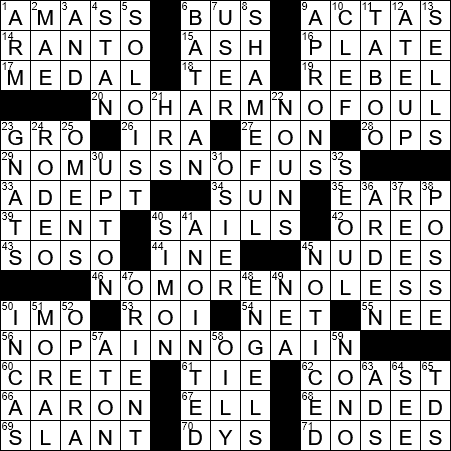 Why didn’t you also explain 23 ACROSS and 28 ACROSS? OPS to photo or black operations. had 0 omissions and 0 errors in about 30 minutes, a very fast time for us. on CST and that puts us a lot earlier than farther West. Kudos to all. NYT #1231 from my paper today,13::53 no errors. evidently are not crossword puzzle fans. This puzzle was in the center of the page with advertising on top and below which made it very awkward to lay out and write on, but alas we survived. LAT: 6:58, no errors. Newsday: 6:09, no errors. WSJ: 6:45, no errors; no surprises on Friday’s meta. New Yorker: 19:44, no errors. BEQ : 35:51, no errors. More to say, but no time to say it, as I’m headed for the high country … 😀. 6:21. Monday puzzles bore me in general, but it’s about all I have time for these days. Sigh. I suspect your Saints could have put up a better fight than the Rams did yesterday. They were robbed from getting the opportunity. 5 minutes on the dot, and no errors. So, of course, I came here knowing Bill would manage it in 4 minutes and change. He’s a tough one to out-do. Maybe five times over the course of a year, will I manage to better his performance. My times were not that great but I managed to do this, (for me) an easy puzzle. I enjoyed it throughly!! With a pocket calc on my side I figured that if Louis XIV reigned from 1638 to 1715 … it was 77 years not 72 …. to double verify I went to wiki and discovered that 1638-1715 was his lifeline and he became king at 4.5 or 5 Yrs old so his reign was indeed only 72 years…. A Roman joke … a Roman walks into a bar and asks for a martinus. ‘You mean a martini?” The bartender asks. LAT: 5:38, 1 error. WSJ: 5:23, no errors. Newsday: 5:41, no errors. New Yorker: DNF, 43:08, 6 errors. BEQ: DNF, 41:00, 5 errors. CHE: 8:51, no errors. You asked about the possibility of e-mailing me a long time ago. You can do so through my site you can get to by clicking my name on this post. Easy puzzle. Takes me longer because of age issues, and that won’t get better. @Vidwan – can’t wait to tell my Italian speaking husband your jokes! Did anyone else see this line in the LA Times?